When I made and posted a basket weave a few months ago it was not only very popular here but also among my family and friends. My intent was to make only one for a dear friend for a Christmas gift, but ended up making many more for Christmas gifts. http://lumberjocks.com/projects/90231 Here is the project link for that basket weave board I made and posted here. This one and the others I made as Christmas gifts were all made the same. All made from maple, walnut, and cherry. With the board I am posting today I wanted it to be different. I wanted it to be bolder with the color contrast and wanted slight changes in the weave pattern from the ones I made before. 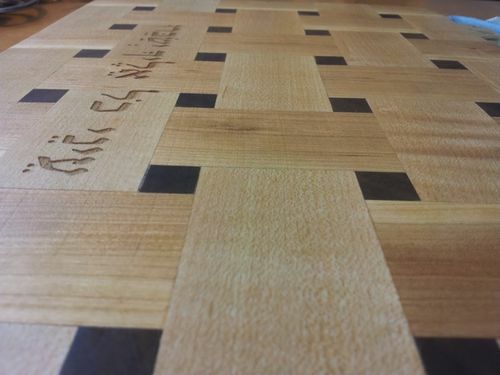 This board is made from purple heart and hard white maple. I chose to use the purple heart in the weave pattern and the maple as the background and I added additional strips in the weave pattern which I think really enhance the contrast even more. The finish is food grade mineral oil. The feet are from Home Depot and I used #8×1/2” stainless panhead screws and not the screws that came with. The overall size is 7/8” x 10-1/2” x 16-1/2”. The maple blocks are 7/8” x 1-1/2” x 1-1/2”. The weave blocks are 7/8” x 1-1/2” x 1-1/2” and 7/8” x 1-1/2” x 4-1/2” overall. To achieve the 1-1/2” width in the weave blocks, I used 2 maple and 2 purple heart strips that are 3/16” each and the purple heart centers are 3/4”. These are fun to build. But require careful set up and accuracy. With all the boards I’ve built so far I mill a test piece as I mill the work pieces. That assures me that everything is same 1-1/2” width. I use the test piece to dial in the exact length of cuts. Any discrepancy will result in gaps in the weave pattern. I also figure in enough material so I can make extra pieces to pick and choose from for the best grain match. I use a jig lined with wax paper that seems to work well for assembly. It keeps everything flat and square. I glue all 47 pieces at once so I number each in order to avoid confusion in a short window of assembly time. This board is for my mother’s upcoming birthday. She really liked the one’s I made before and “hinted” that she would like one in her kitchen. I must again give out credit to these fellow Lumberjocks. They are all very skilled craftsman whom shared their talents with us and inspired me to tackle crafting these boards myself. Excellent job. It’s always good to acknowledge your inspiration. Of course now you have become the inspiration for others. Great job. The basket weave catches my wife’s eye. It will be on my list soon. She wants a original one, whatever that means. So either I copy yours or I’ll have to do some thinking. Thanks for sharing. Thanks doubleDD and Mrs. doubleDD for the compliment. PM me if you have questions if you want to copy mine. Otherwise, the links to the Lumberjocks I posted above is a great place to start. There are many great cutting board ideas here. 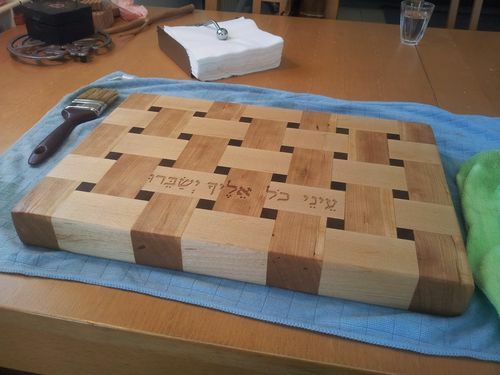 Really great work, nice and clean…..
WoodMechanics ….thanks for the compliment ! Thanks again to everyone who commented and added this project to their favorites ! Thank you Lumberjocks for the Daily Top 3 ! Love this board, I think need one for myself! Net55….Hey thanks for the compliment !